THE SBA...WE GOT OUR FIVE, GET YOURS! For nearly a decade, the Street Basketball Association has pioneered the dream of street ballers around the world by merging street ball’s credo of “true grit, true game” with “true entertainment and enjoyment.” Whether it is played on dirt courts, in the backyard or the asphalt of inner city playgrounds, the SBA’s trademarked brand of street ball boasts an unmatched passion and enthusiasm for creativity that is crossing over all geographic, cultural, and economic lines. Our mission is to showcase the best "street" and “professional” basketball legends center stage, in an organized, competitive environment to compete, entertain, and educate. 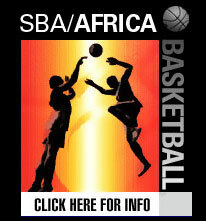 The SBA is also dedicated to discovering and introducing some of the world’s greatest basketball legends. From the butcher’s son in Beijing to the mechanic who plays pickup at Rucker’s Park, these ballers have not only game, but extraordinary talent. The SBA will be their voice, their outlet, their draft. The SBA is the vision of a talented group of individuals who are dedicated to the advancement and growth of street ball. In fact, if you walk down our hallways it might be hard to distinguish who’s the biggest fan. WE ARE STREET BALL. One thing all cities, towns and countries had in common was outdoor hoops and street basketball. Each city had its own unique style of "street ball" and laid claim to having the most eye catching and innovative moves from a dazzling crossover to a killer slam dunk; and every city, playground and community boasts a five-man team that their fans swear will beat any five-man team not on an NBA roster. Some even say they can handle the "pros". The SBA and its sponsors are making these street challenges a reality. Our vision is simple, “take it back to the streets, deliver it to the world”. Ask any NBA pro-basketball legend the question, "Who was the best basketball player to ever play the game?" The answer will probably be that of a player who never put on an NBA jersey by the name of Earl "The Goat" Manigault. A legendary street-baller from New York City, with an inhuman vertical jump of more than 60 inches, the Goat, along with the current generation of street ballers like him have for decades entertained fans in urban, inner city and rural communities throughout the country. No contracts, no endorsements, no glory, they do the unbelievable on court and they do it simply for love of the game. For many NBA players, such as LeBron James and Carmelo Anthony, the real test of their skills is not what happened in a multi-million dollar sports complex, in front of millions of TV viewers. Instead, the real test is how much game thrust they can deliver against the raw, unharnessed, hip-hop subculture of the best street-ball players in the world. 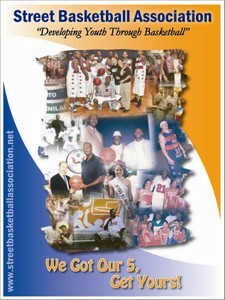 The SBA is developing the first ever-professional street basketball league that will operate June through September. The league will be comprised of the top 10-15 players from their home cities to compete against other cities throughout the United States and abroad. We will supply a demand for highly entertaining and competitive, professional basketball during the "off-season" summer months, provide a platform for players to showcase their talents, create jobs for players, and most importantly return basketball back to its communities and roots. The SBA's catch phrase says it all "WE GOT OUR FIVE...GET YOURS!" The SBA will pursue a national television contract to allow fans worldwide the rare opportunity to experience some of the most dazzling and unparalleled street-ball players and team performances available anywhere. During league games, the SBA intends to create an atmosphere that will surpass both the Rucker League (New York) and the Urban Coalition (D.C.). The SBA will entertain crowds with players displaying vicious killer crosses, behind the neck no look passes, and 720 degree slams while our DJ mixes the latest hip-hop beats. Up and coming and current top 40 artists will provide the audience with a sample of new live music to help enhance the overall SBA experience. Charitable giving and fundraising is a major focus of the Street Basketball Association. Instead of re-inventing the wheel, the SBA has partnered with local governments, religious groups, parks and recreation departments, schools, charities, and other community outreach organizations. The SBA believes there must be a united effort on and off the court to create a positive impact that will manifest in our communities for a common objective to Save Our Youth. The SBA will use basketball as the recreational; and motivational catalysts to launch our enrichment, mentoring, community service, and fundraising programs. Through basketball, we are able to build character, confidence, responsibility, accountability and a host of other qualities that will aid in personal, family, and community development. Basketball teaches the value of Teamwork, not I work. This is a fundamental life lesson that can be employed in all situations to further enhance our quality of life. The SBA creates a fertile landscape for players to develop their talent in a highly competitive atmosphere under the guidance and leadership of former NBA professional players and other industry professionals. SBA players, coaches, management and staff all serve as a talented human resource pool for other pro leagues including the NBA, NBDL, CBA, ABA, WNBA and leagues throughout Europe and the world. The SBA staff is available to be called up at any time.